Boat is located in El Dorado,KS.Please contact the owner @ 316-880-2396..Up for sale is my beLoved 26 foot long, S2 brand Sailboat, after some difficult decision making - Its located in dry dock at El Dorado Lake, in El Dorado, KS at the moment. Its just waiting for the new owner to tow it home !! I live in West Wichita BTW. Comes with trailer - see photos Here are the details of sailboat ( I live in NorthWest Wichita ) [near 21st & 119th] Maker : S2 Model: 8.0b Length: 26 feet Motor: Gasoline Mercury 9hp outboard ( $4000 when new ) It has new carpeting installed, a near new 4 cycle gasoline outboard motor ( less than 5 hrs total run time ) and only used in Fresh water. Outboard motor also has Hydraulic lift mechanism, which is very handy and useful. Boat has has a retractable Keel which can be used in as little 4 feet of water, which allows you to get very close to shore if needed. With Keel full extended, minimum water depth needed for operation is 8 feet. Comes with both Mainsail and forward sails - Has several Life Jackets - refurbished hand pump for Manual discharge of sump - Comes with a Head / Toilet, Forward Bunk sleeps two comfortably and the aft bunk or the dining area can sleep two. There is also a portable like new Air Conditioner that fits into the hatch. All of the exterior has the new trim which has a Teak wood appearance, but it not wood, so no Maintenance or seasonal treatment is needed. 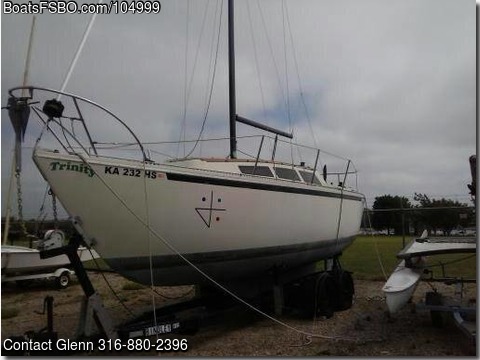 I am asking $9,000 for the Sailboat, and outboard motor, which is located at the Walnut Valley Sailing club in El Dorado Kansas. please contact me for any further questions, or if you like to see it in person.